This is one of my favourite new recipes, and I’ve made it a few times this summer already. I can honestly say that this is my favourite tofu recipes I’ve ever made, and right now one of my favourite meals period. And I’m not a vegetarian! The guajillo chili salsa is a garlicky olive oil sauce with orange juice and cilantro – packed with flavour, which is just what tofu needs. I make up a recipe of the salsa and keep it in the fridge to use on various foods, including grilled chicken and shrimp. This time I served it on a bed of greens with grilled fresh zucchini. Another time I made it with spinach and my favourite dressing. 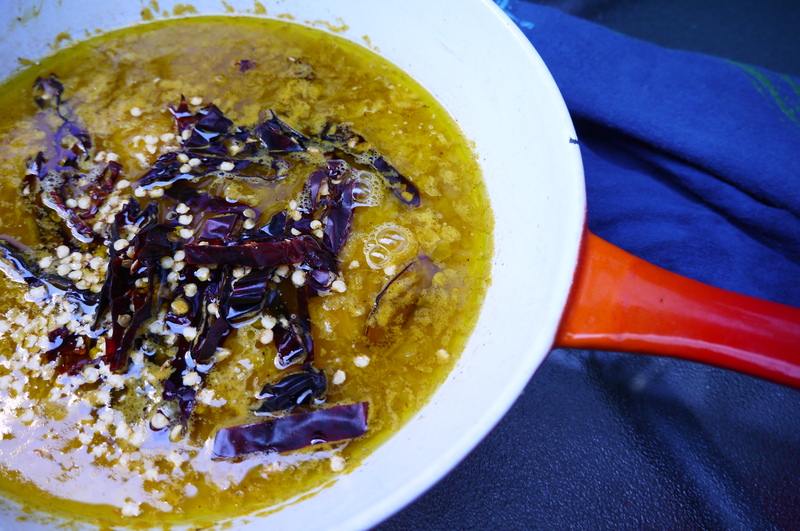 I like to prepare the guajillo chili salsa a while before I need to use it so the flavours have a chance to mingle. To begin, heat a frying pan to medium heat and add the olive oil. Add the garlic, pepper and a liberal amount of salt, and stir once in a while. When it is slightly golden add the orange juice and guajillo pepper strips, seeds and all. Let this simmer for a few minutes. Set aside to cool, then use an immersion blender or food processor to blend with the cilantro, stems and all. Season to taste with salt and pepper; I find it usually needs a bit more salt. Refrigerate to use when you wish. Pat the tofu dry on a towel then slice about 1.5 – 2 cm thick. 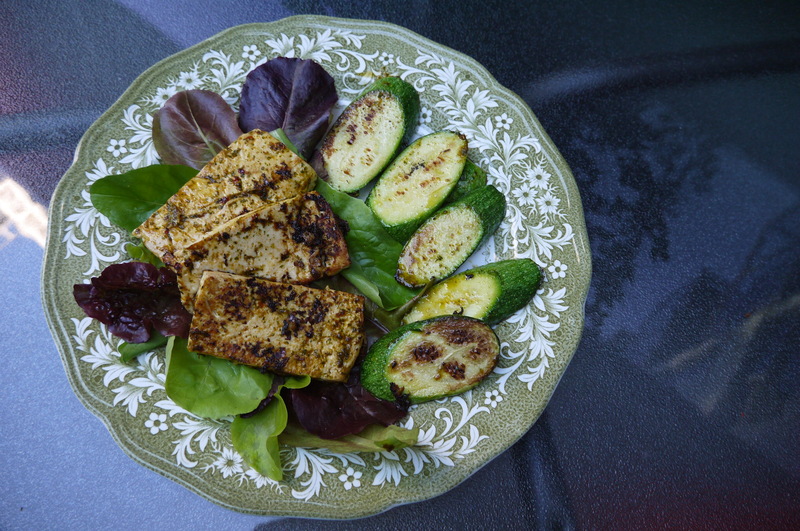 Heat a little olive oil in a frying pan and add the tofu strips. 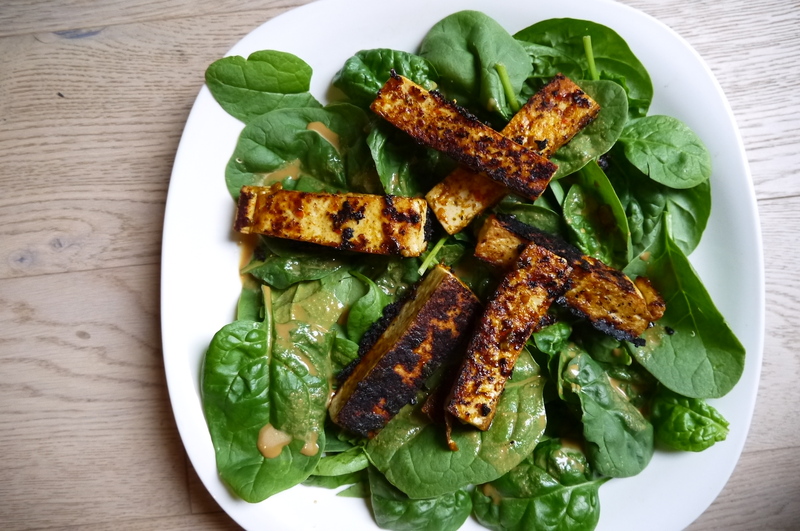 Spoon about one teaspoonful of guajillo chili salsa on each strip of tofu, then flip them. Let them fry for about 2-3 minutes on that side, then add another teaspoonful of salsa to the other side and fry that for another 2 minutes or so until it has darkened a bit. When you remove it from the pan make sure to scrape up any baked-on bits of salsa and spread them over the tofu. So tasty!